Looking to shop til you drop? This city is so huge that it’s hard to know the best places to shop in Los Angeles. It seems as though LA has a store, boutique, or thrift shop for any kind of style you have. Whether you’re a rock ‘n roll type of girl or you’re more boho chic, or even if athleisure is more of your thing – there is something for you! You know what they say, shopping is the best type of cardio! So if you’re in the mood to get your shop on and treat yourself for some new items in your closet, here is The LA Girl shopping guide to help you find the best places to shop in Los Angeles. If you asked any person from Los Angeles where they would recommend you to go shopping at, then most likely they would tell you to head to The Grove. The Grove is a beautiful, outdoor shopping area that has a host of stores – from Topshop, Nordstrom, Banana Republic, Anthropologie, Nike, Sephora, and more. In addition to shopping, it’s also a great place to take a stroll or even ride on the fun trolley. There are also a lot of events that are hosted at The Grove so you’re always bound to have a good time there. If you love The Grove, then you’re definitely going to need to head on over to its sister center, The Americana at Brand. The Americana is much bigger than The Grove so that only means one thing: more shopping! The Americana is located in Glendale and shares some of the same stores that are also available at The Grove. Some other stores at The Americana include BCBGMAXAZRIA, Cole Haan, Barneys New York, David Yurman, Lululemon Athletica, and more. Every shopper has a great affection towards Melrose Avenue for all of its fabulous boutiques. There isn’t a time where you can walk into one of the shops on Melrose Avenue and not buy anything – it’s almost unheard of. Melrose Avenue has an endless amount of boutiques that offer clothing items that are unique and harder to find in other stores. Crossroads Trading Co. is also on Melrose Avenue where you can buy and exchange clothing – a perfect place to find those vintage items you’ve been looking for since forever. There’s also a ton of cool walls to take pictures! Speaking of Melrose, every Sunday, the people of Los Angeles come out to the open-air market known as the Melrose Trading Post. It’s a great Sunday affair where you can shop for some vintage clothing items as well as antique goods. So many celebrities also make their way to the Melrose Trading Post, so you never know who you might bump into while you’re shopping. After a wonderful day at the iconic Santa Monica Pier, there is no doubt that you’re going to want to go to the Third Street Promenade for some shopping. It’s another one of LA’s amazing outdoor shopping area that has stores including Urban Outfitters, Aldo, Armani Exchange, GUESS, and many others. You’ll also get to see some awesome and incredibly talented performers on the Promenade which is something enjoyable to watch when you need a little rest from all of your shopping. Right by the famous Venice Beach is Abbot Kinney Boulevard, where many LA locals like to hang out, grab a bite to eat, and of course – shop! Abbot Kinney is said to be the “coolest block in America” and we can see why. Shopping is all about treating yourself for something special, right?! Retail therapy is the best! Rodeo Drive is known for not only being a great tourist area for people to see all of the high-end stores, but it’s also a fantastic place to shop at too. From Bulgari, Burberry, Cartier, Celine, Chanel, Coach, Dior, and more – Rodeo Drive is every shopper’s heaven whether you’re shopping or window shopping. There is never a dull moment on the Hollywood Boulevard and that statement applies to shopping as well. 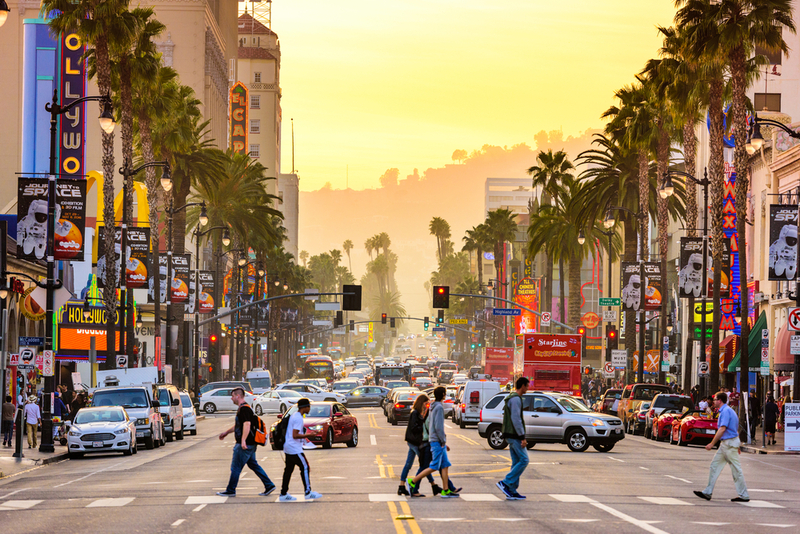 We know the Hollywood & Highland center for great tourist attractions such as the TCL Chinese Theatre and the Walk of Stars, but there are a ton of stores for you to shop at whether you’re buying souvenirs or something for your wardrobe. Louis Vuitton, Lucky Brand Jeans, MAC Cosmetics, Victoria’s Secret and many more shops are calling your name at the Hollywood & Highland center. Since fashion is such an important part of the LA lifestyle, it’s only natural that Los Angeles has its very own fashion district in Downtown. The LA Fashion District offers a lot of shopping for wholesale businesses, but a lot of retail shoppers head over there too. Plus, it’s a great place for people to buy clothing at discounted prices. If you’re over the mall, check out quaint Main Street in Santa Monica. Similar to Abbot Kinney with more independent boutiques than well-known chains, there’s also a weekly farmers’ market and a great selection of coffee shops, nail spas, restaurants and more. Not to play favorites, but check out Ashland Hill when you get tired of shopping for a drink and something delicious! If you’re looking for more Los Angeles guides, check out our neighborhood guide to Downtown Los Angeles or Santa Monica. If you have suggestions to add to this list, tweet us @thelagirl!